On Friday 18th October at Rhondda Fach Sports Centre, it was the first RCT SEN/Nurture Dodgeball tournament ran by 5×60 which is the first tournament on the competition calendar this year. 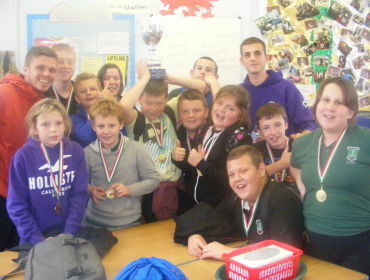 All schools took part in Rhondda Cynon Taf and competition was high. Tonyrefail Comprehensive entered two teams – organised by 5×60 officer Leon Bansal – and the young people that took part were excellent throughout with both teams managing to get into the semi finals. In the end, Tonyrefail got to the final and picked a strong team for the final match where they beat Ferndale Comprehensive after a gripping and intense match. All the players were a credit to the school and picked up the trophy in the end, to everyone’s delight. 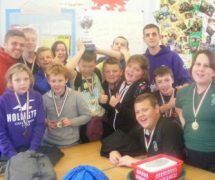 May this be the first of many tournament victories for Tonyrefail Comprehensive School – the nurture group have set the standard high. I would like to personally say well done to all the students from SEN/Nurture group and thank you to Joel Berry of the Detached Youth Worker team for his support on the day which was fantastic. Seeing all the young people taking part on the day demonstrates the power of sport and how important it is for the health and well being of young people. The tournament itself was well organised and a big well done to Nichola James, 5×60 officer for Porth, who took the lead for this competition. Look forward to future tournaments.